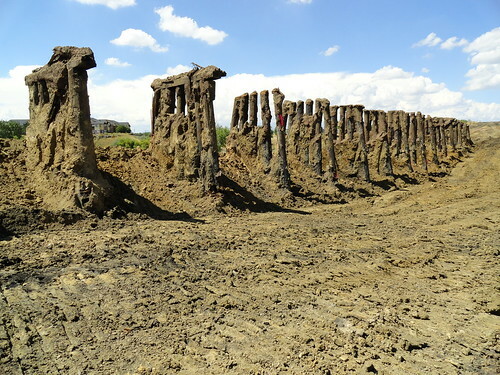 As North Metro Rail Line construction crews moved into the Grange Hall area-just south of the Northglenn•112th station to begin a massive drainage project, they unearthed an old railroad trestle bridge. RTD's contractor on the project, Regional Rail Partners, halted construction in the area upon discovery of the bridge. Historic preservationists were given the opportunity to look at the find. After researching the bridge, RTD determined the design plans for the bridge date back to 1911 and the track dates back to 1909. Records indicate the bridge was built to carry the Burnham Yard Lead over Grange Creek that flowed through the area in the early 1900s. You can see it in the photo gallery. Hover your cursor over the image to activate the photo gallery controls. Spanning a wide drainage area with a trestle bridge was not uncommon in those days. But in 1951 Union Pacific piped Grange Creek and backfilled the area with an embankment. The bridge they buried is the one North Metro Rail Line crews just uncovered. It was a 14-span, 109 foot-long bridge. Another example of our rail history is west of the tracks and south of 112th Avenue where there is a stub that circles back south, crossing Grange Hall Creek west of the main line. This has now become the back entrance into the Regatta Apartments off of Leroy Drive. It also has an 8-foot culvert under high fill. The "Regatta Spur" can clearly be seen today on Google Earth. Upon determination that the Grangehenge Bridge, referring to what looks similar to Stonehenge when uncovered, had no historical value, Regional Rail Partner crews moved back into the area to continue construction operations.